JBL Control 26C Ceiling Speaker DJParts - All Variety of Parts that DJ Needs.  Packaged with grille, backcan and tile rails for fast installation and easy dealer stocking The Control 26C is a compact ceiling speaker providing premium performance in background, foreground music sound systems. The Control 26C is perfectly suited for a wide variety of applications from casinos and hotels to upscale restaurants and themed locations. 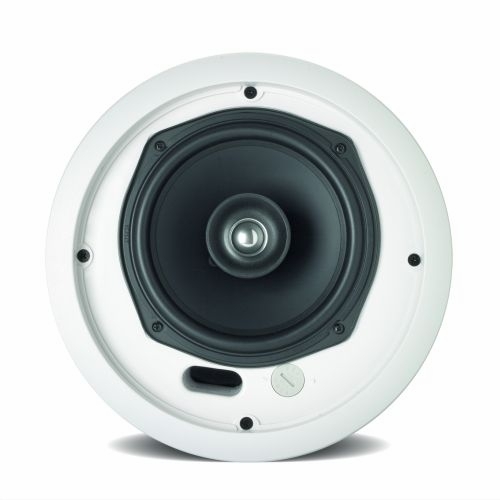 High power handling, wide frequency response and low distortion make the Control 26C ideal for sound systems requiring a higher fidelity sound from ceiling loudspeakers. The premium performance capability ensures excellent sound character, providing pleasant, enveloping sound throughout the listening area. The Control 26C’s 16 ohm impedance allows use of multiple speakers in parallel without having to use a more expensive constant voltage distributed system. The optional Control 26CT version includes a multitap transformer for 70V/100V systems. JBL’s exclusive SonicGuard overload protection is a non-invasive loudspeaker protection system that is inaudible to the listener, ensuring reliability while providing full fidelity sound. The computer-optimized ported enclosure delivers warm, smooth bass response. Low frequency output can be further augmented with the addition of one of the Control Contractor subwoofer models. The 165 mm (6.5 in) woofer features a polyurethane-coated cone and pure butylrubber surround for long life, even in high humidity environments. An aluminum voice coil former provides extra cooling for greater long-term power handling. The coaxially mounted 19 mm (¾ in) titanium coated tweeter provides crisp, clear highs. Diffraction-loading of the tweeter provides wide, even coverage of the listening area. The extremely broad 110° coverage pattern allows for fewer speakers to be used, making for a simpler and less expensive installation.